The Best TESOL Certification Courses in Canada! Qualify For the Best Jobs in Canada! Your lesson planning skills will be key to help you advance in your career. What sets us apart is the level of training in lesson planning that our students receive in our courses. Our graduates are teaching English in the best programs in Canada and throughout the world. The training you will receive from OnTESOL will open many doors to lucrative and renowned positions such as Director of Studies, university professors, LINC Teacher, and IELTS examiner thanks to the training they received from us. 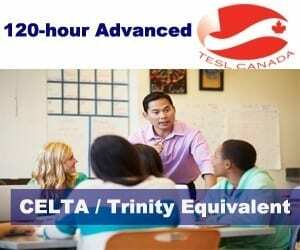 Experienced ESL teachers returning to Canada, who need to pursue TESL Canada certification online and at their own pace. People who are seeking an international career and would like to get the best training from the beginning. The 250-hour TESOL course will prepare you for exciting career advancement opportunities and lucrative teaching jobs worldwide. Those who want to teach English abroad and need an internationally recognized TESOL certification. Those who want to teach at Canadian language academies. Canadian public school teachers who want to get professional TESOL / TESL / TEFL training on planning ESL lessons using the Communicative Approach. Testimonial – Chris Noel: The TESOL Diploma course is full of relevant and high quality information and activities/lesson plan ideas that would easily work well in all ESL classes. I could instantly see the real life applications for all of the theory that is included in the course as a whole. My tutor was always helpful and timely in giving assignment feedback. Overall, I thought the course was well put together and challenging. I am 100% satisfied with OnTESOL’s 250-hour TESOL Diploma course.